The Deputy Chief Minister of Arunachal Pradesh, Chowna Mein informed that government has undertaken several initiatives and instituted policy measures to preserve, develop, promote and protect the age-old indigenous culture, arts, language, folklore and music of the state. He said this during the grand finale of Tani Idol 2018, a singing competition organised by the Arunachal Pradesh Apex Tani Foundation (APATF) at I.G.Park, Itanagar on Sunday night. There was a time when there was no exposure or any scope for our people to showcase their talents but today the state has made tremendous progress, and this could be seen in the form of lots of mega shows and events being organised in the State to provide them with the platform to showcase their hidden talents, said Mein. The event show music aficionados coming out in large numbers to support their top 5 finalists, Ram Tagang, Binod Pegu, Meenam Goi, Marpi Bam and Devokanta Taid who were judged by State’s celebrity singer Jeli Kaye, John Sonam and Hage Komo, guest judges Asstt Prof from RGU Ashok Burman and a Singer from Assam Beauty Panyang. The top 5 finalists competed on the Local song, Hindi song-selective attributing to Late Bhupen Hazarika and Hindi song-pavilions with back up dancers. 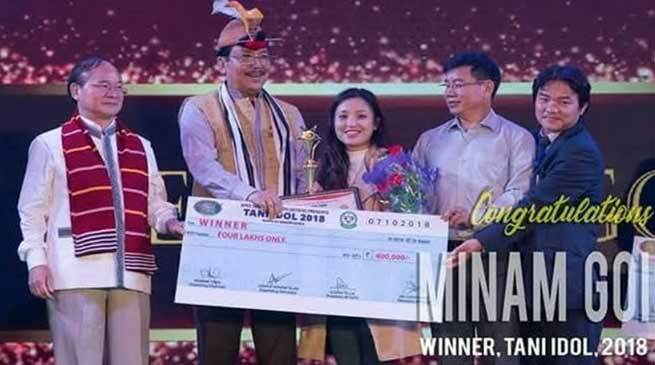 Music aficionados stayed till late night to cheer for their favourites and witness Meenam Goi from Siang district take home the coveted title of Tani Idol 2018 along with a cash prize of Rs 4 lakh and an album contract. Binod Pegu from Assam has adjudged the runners-up who took home a cash award of Rs 2 lakh and an album contract. The awards to the winner were given away by Deputy Chief Minister Chowna Mein.